The SteamVac SUPA GULPA is targeted head-on at flood recovery jobs. 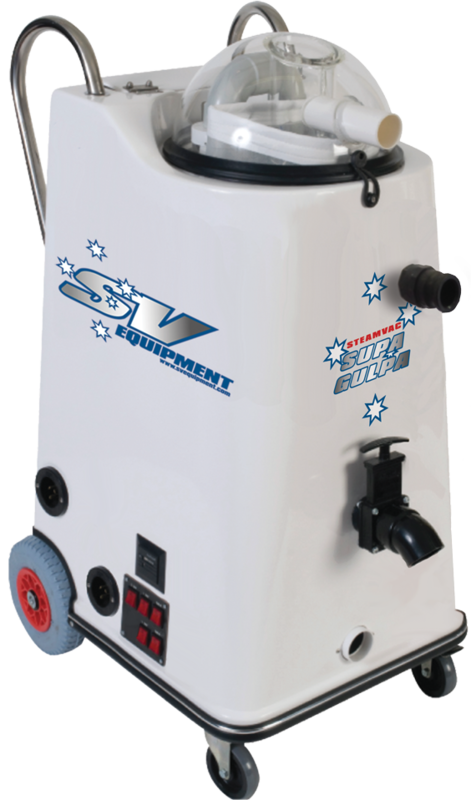 The machine body is based on the best-selling SteamVac RD6 body shape, however that’s where the similarity starts and ends. Instead of a pump/motor assembly coupled to a pressure regulator and 2 vacuum motors, the base of the machine sports 4 vacuum motors mounted onto a 2” ported vacuum chamber which has been completely redesigned to allow maximum air flow. Highly portable, this extraction machine is also up to 18kg lighter than a typical HWE unit, due to the absence of the pump/motor assembly. The SUPA GULPA accommodates a single tank, rather than the typical combination of waste and solution tanks commonly found in HWE portables. This means that the recovery capacity has been doubled. Inside the tank, a supercharged 195lpm submersible waste pump is fitted in order to be able to deal with expelling the much higher volume and rate of water recovery which this machine is capable of. In turn, the waste pump is mated to a 1.5” coupling mounted to the front wall of the machine, to which a standard 1.5” vacuum hose with a one-way valve is attached, to allow a large volume of water to be expelled (unlike standard portables fitted with a waste pump which only have a ½” or ¾” at best waste outlet). Put simply, the machine is capable of extracting and expelling an astounding 100 litres of water within 30 seconds, which is between 4 to 5 times the rates of other portables – for unparalleled performance in water recovery. The SUPA GULPA comes to its own in large areas, be it a commercial or domestic application, where there is extensive flooding and high saturation of floor coverings. Unlike a standard submersible pump which could only be placed in situ, this portable machine can be coupled with any standard 2” or 1.5” vacuum hose and a carpet wand, water claw, or a ride-on extractor for never-seen-before rates of water displacement. If you operate in the restoration industry, you owe it to yourself to take a closer look at the SUPA GULPA. • This extraction machine is also up to 18kg lighter than a typical unit, due to the absence of the pump/motor assembly.